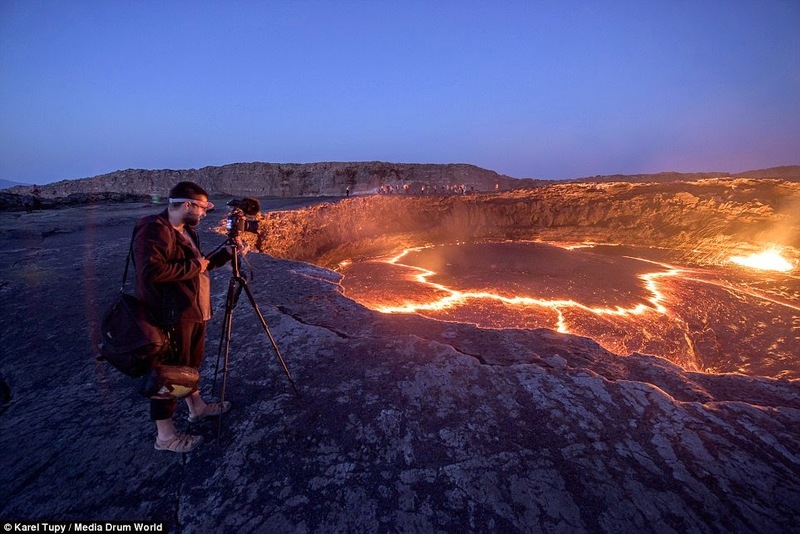 A daring 38 years photographer captures rare images of Lava Lake that's been flowing for more than 100 years in Afar Ethiopia. 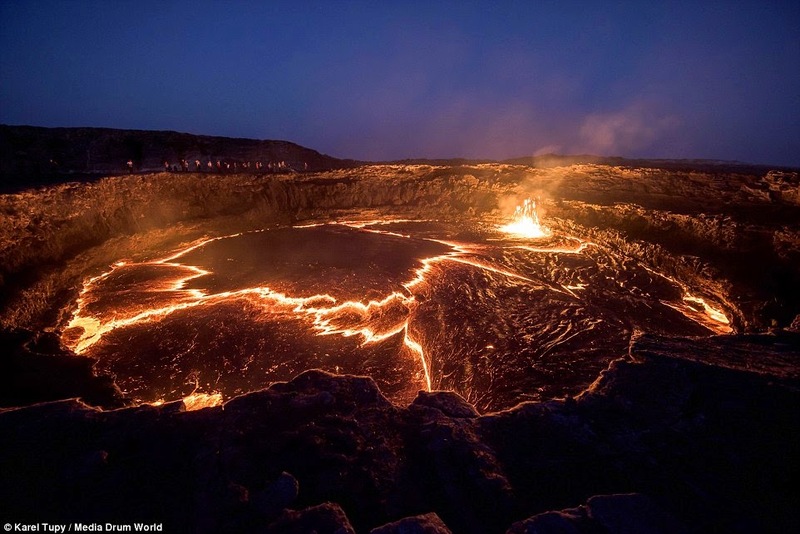 The Lake is one of world’s oldest continuously active lava lakes flowing since 1906. 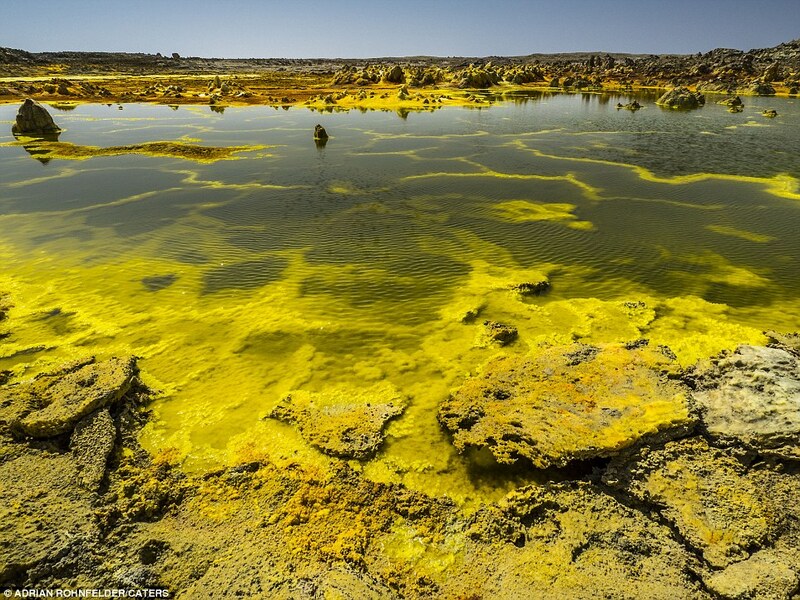 The Portuguese photographer Joel Santos, piloted a drone over the bubbling lake just a meter from the edge. 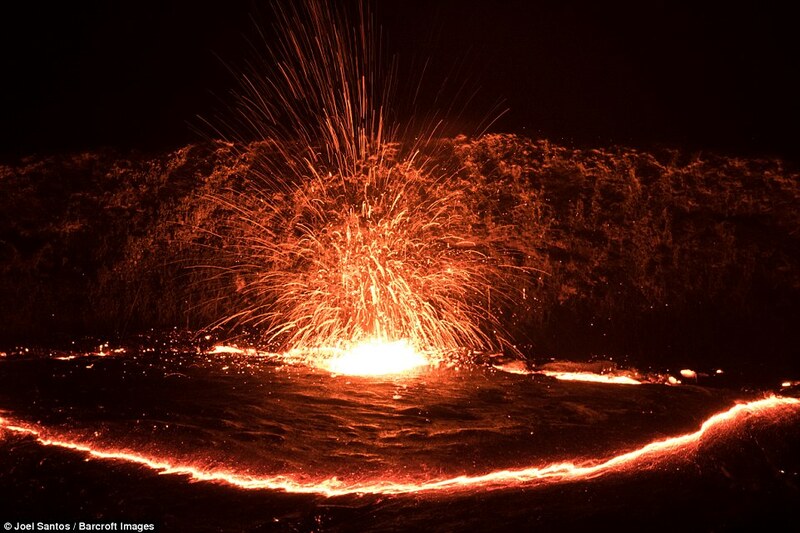 The temperatures exceeding 1,100 degrees Celsius, lies inside the 2,011 foot high Erta Ale volcano. 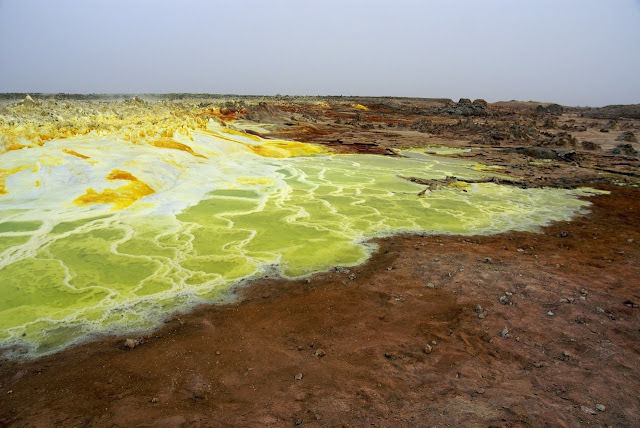 The last threating eruption occurred in Sep 2005, almost killed 250 livestock and forced people to evacuate the area. 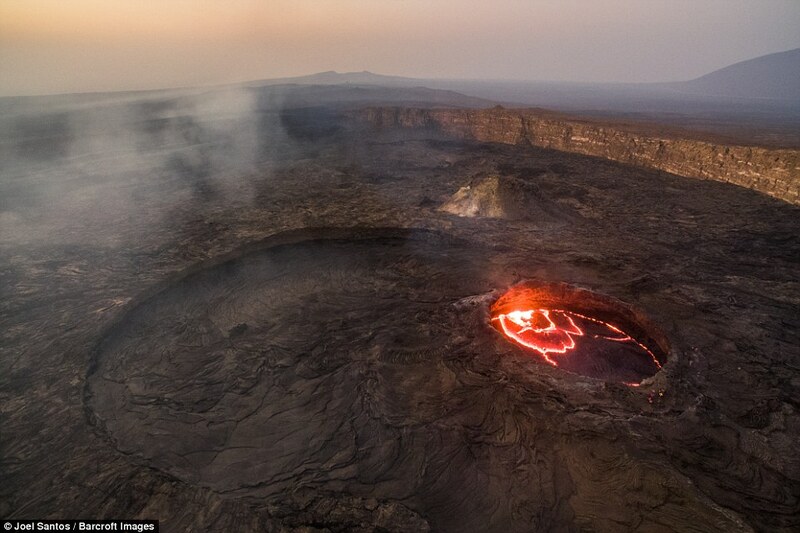 The photographer was well aware of life threating chance of devastating natural phenomenon at such close quarters. The Joel Santos said, this was one of my dangerous projected I’ve done so far, because I was just 20 meters away from the Lava and one meter from the edge. 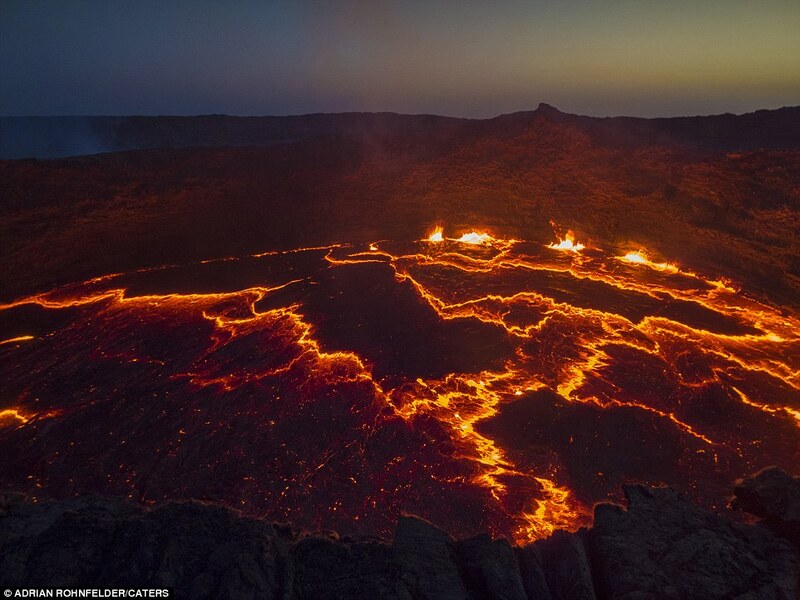 The crater rim is changing lava moves up and down, particularly when it overflows. 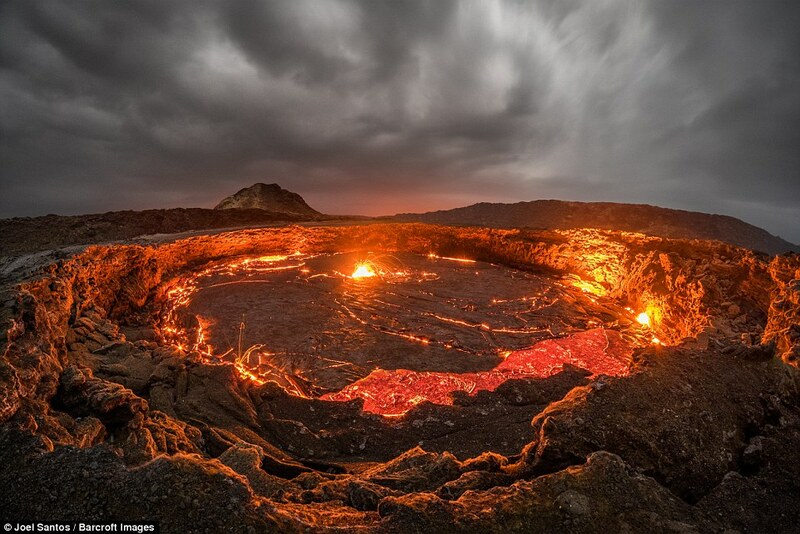 You have to be very careful, the ground you’re standing is solid, but could be soft, make you plunge into Lava Lake. 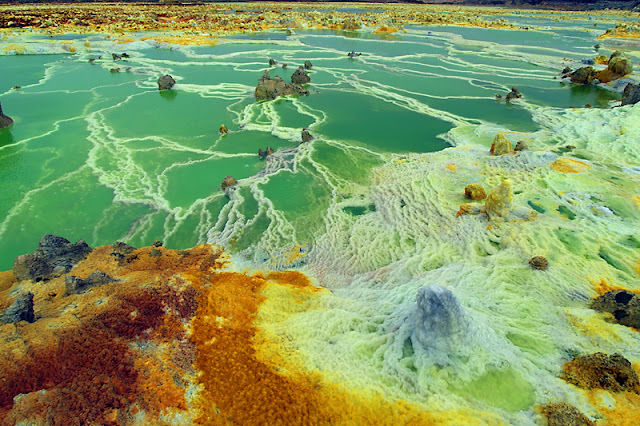 I used a drone camera to capture the 4K footage, which could handle the scorching condition around the Lake rim. 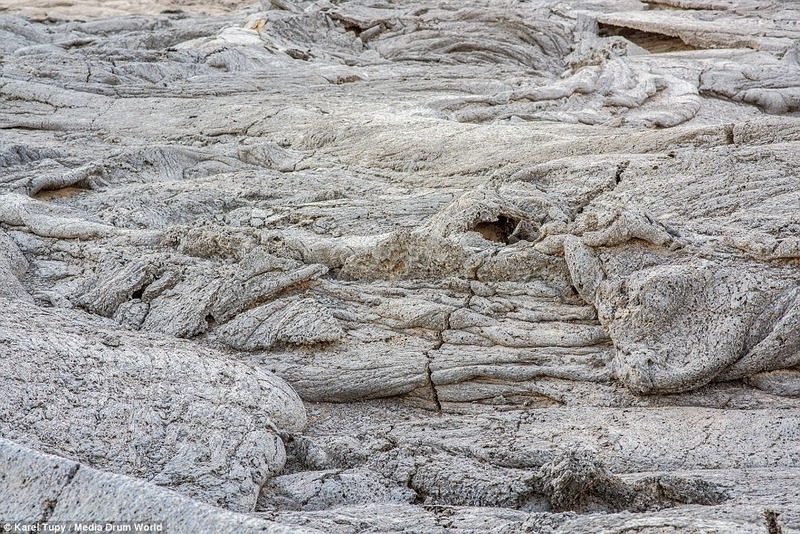 The heat waves are so strong, could cause it melt or crash. After every 2 or 3 minutes I heard a small hiss of pressure beneath the volcano, which I can’t predict when a crack just opens wide. 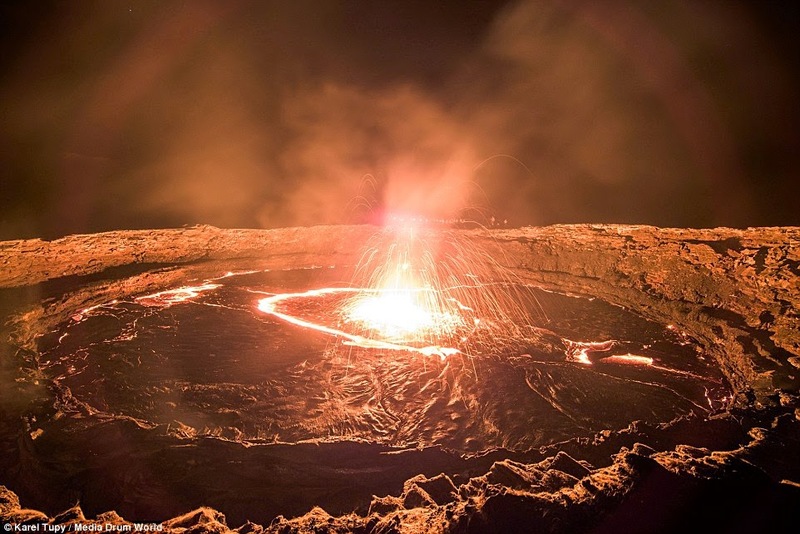 The entire volcano begins to bursting with lava into the air. 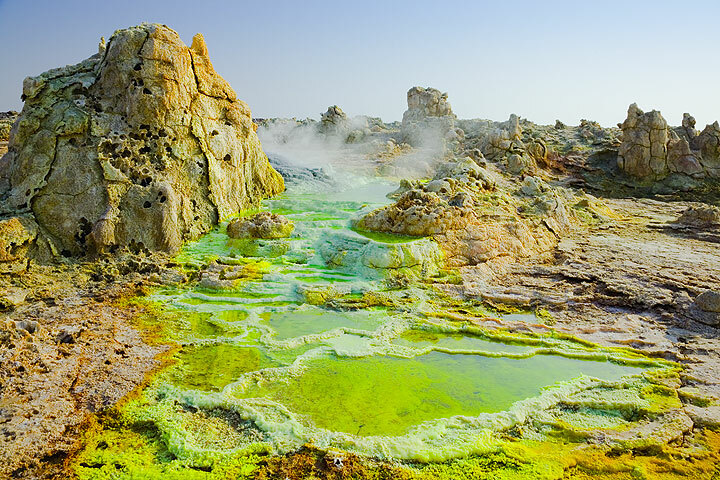 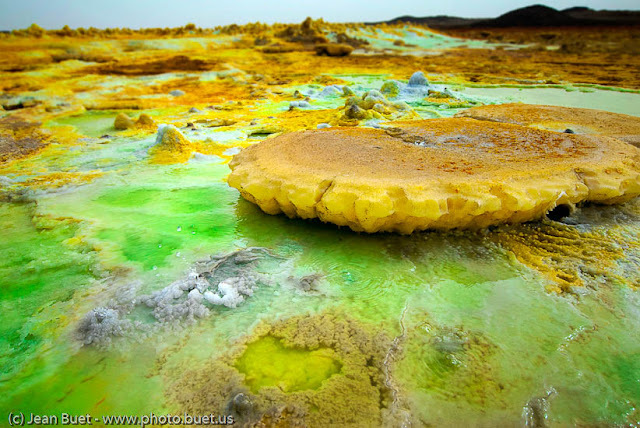 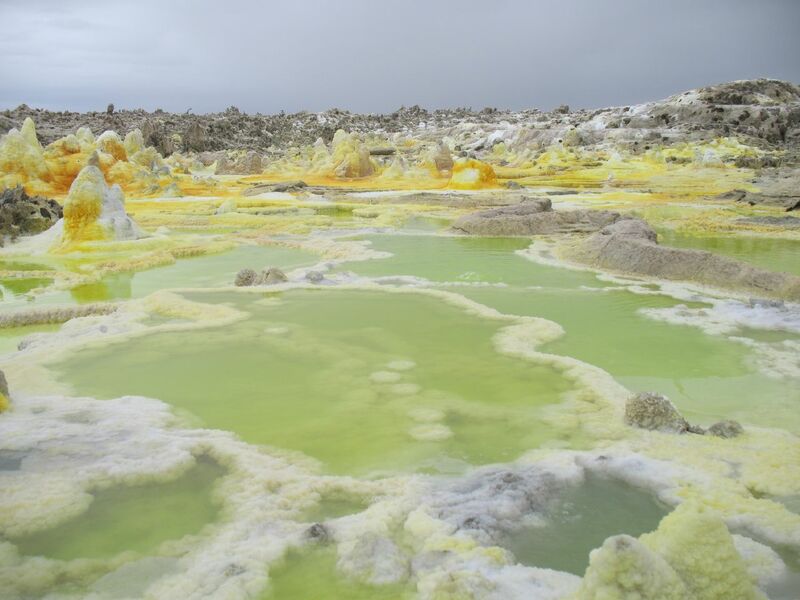 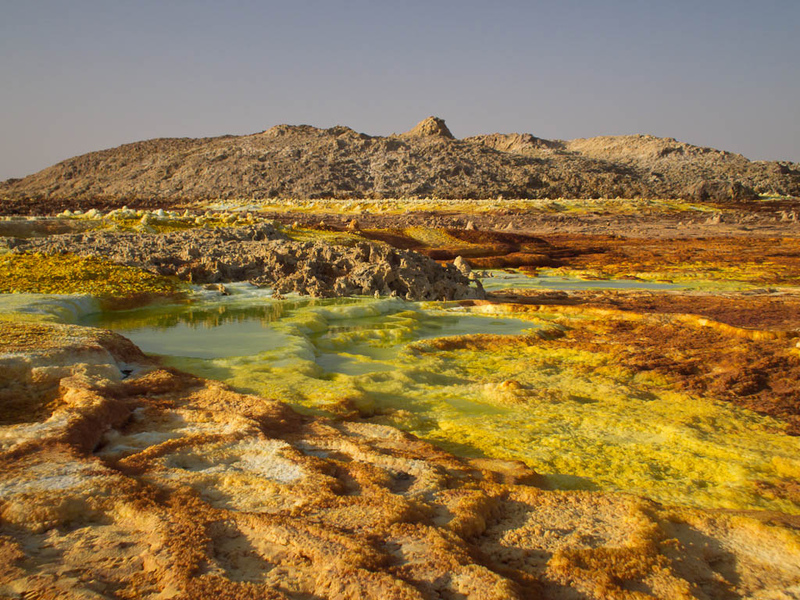 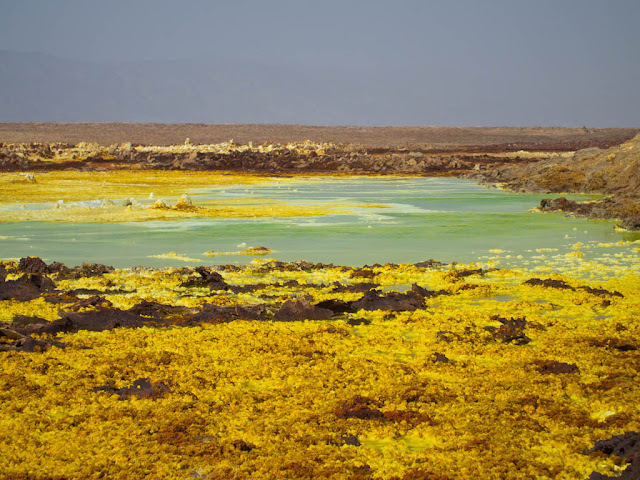 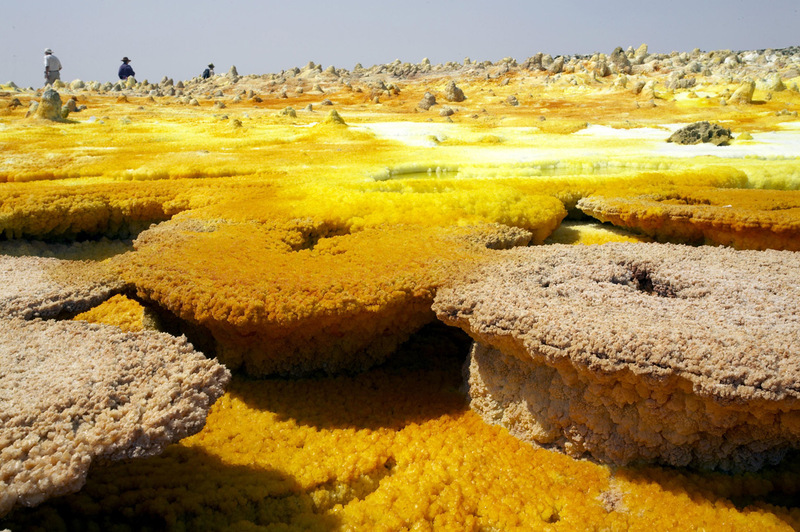 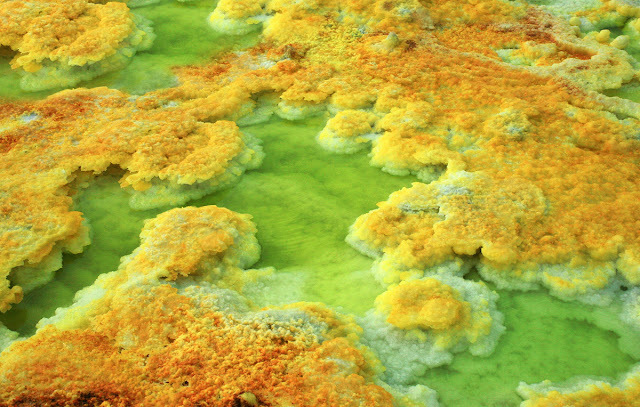 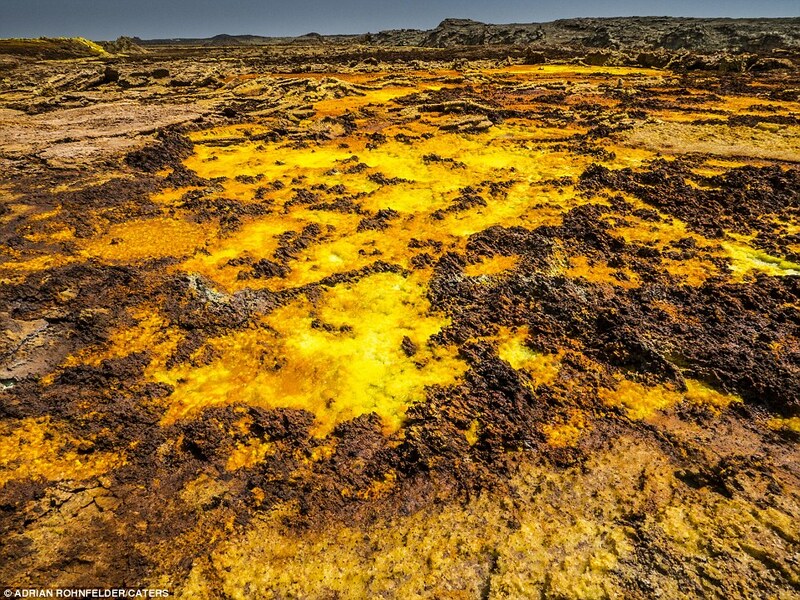 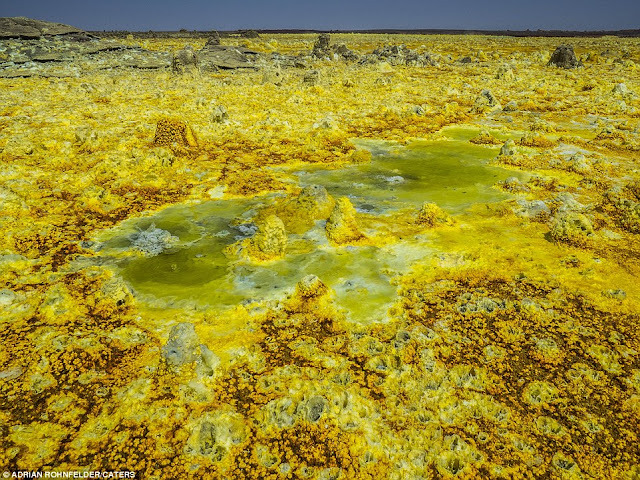 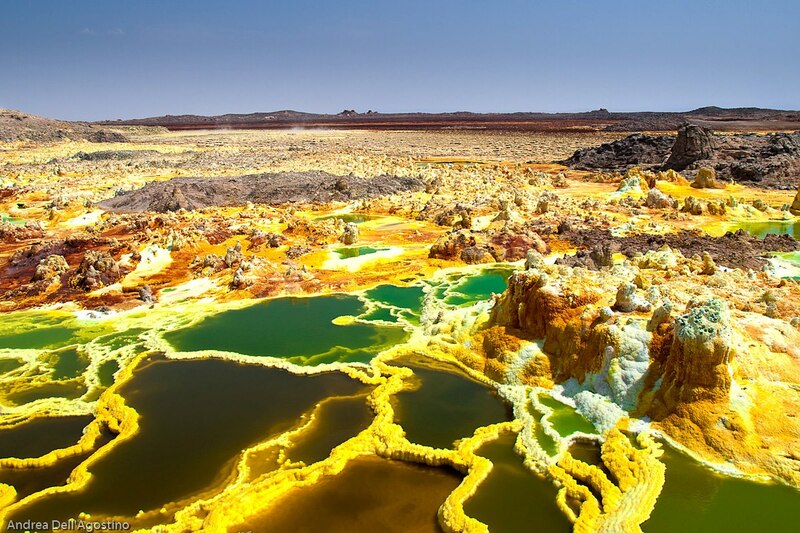 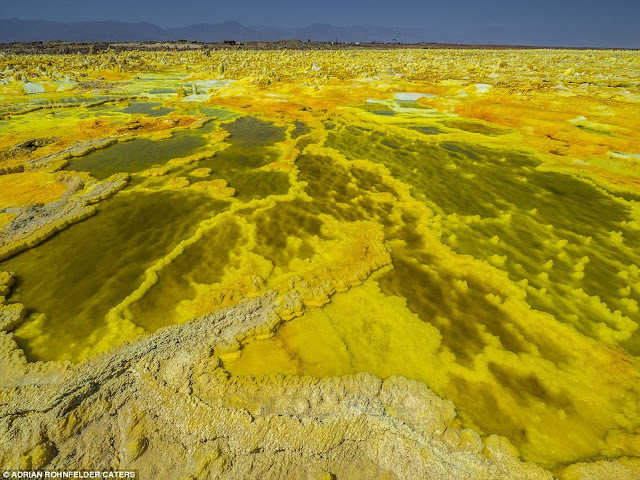 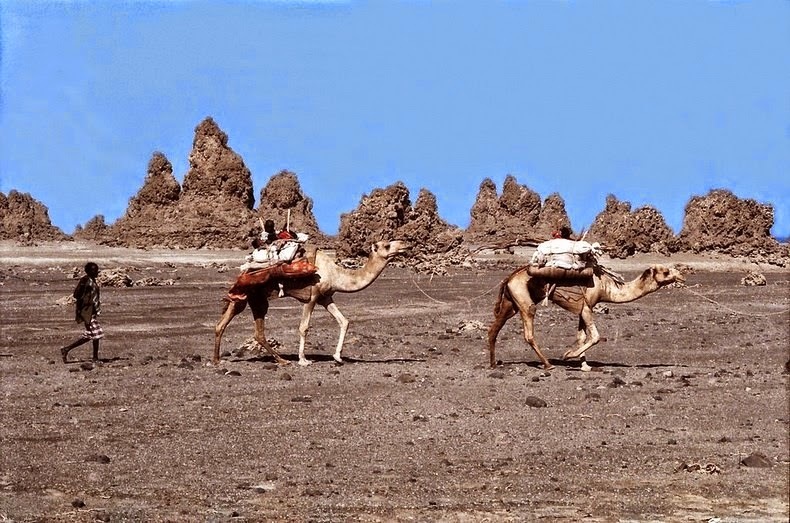 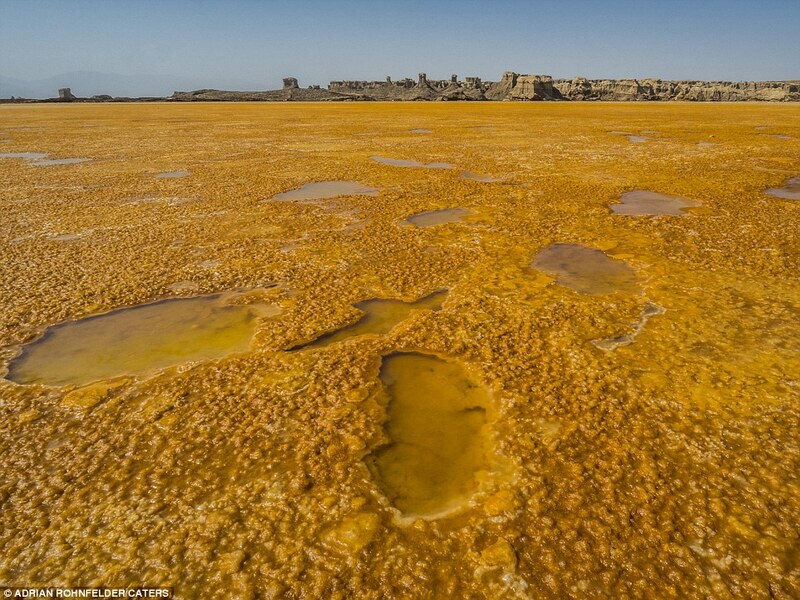 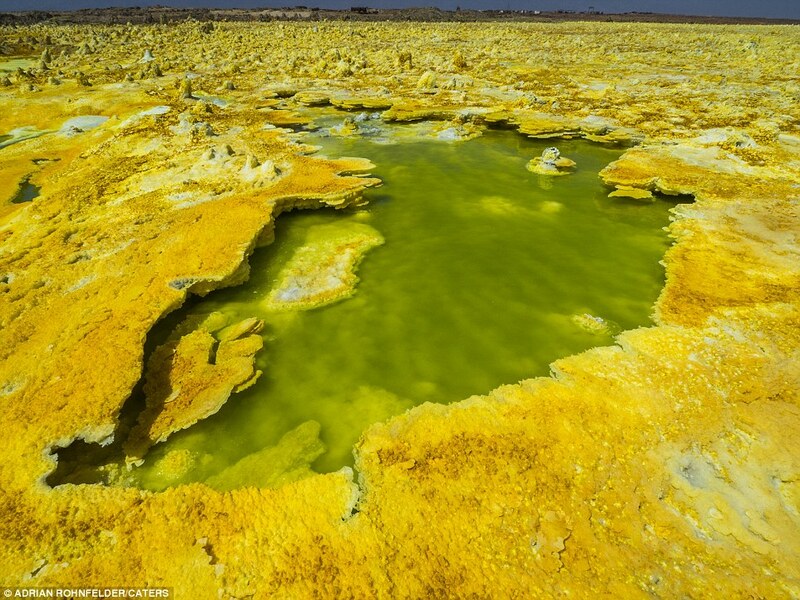 The Danakil Desert is officially the hottest inhabited place on earth. 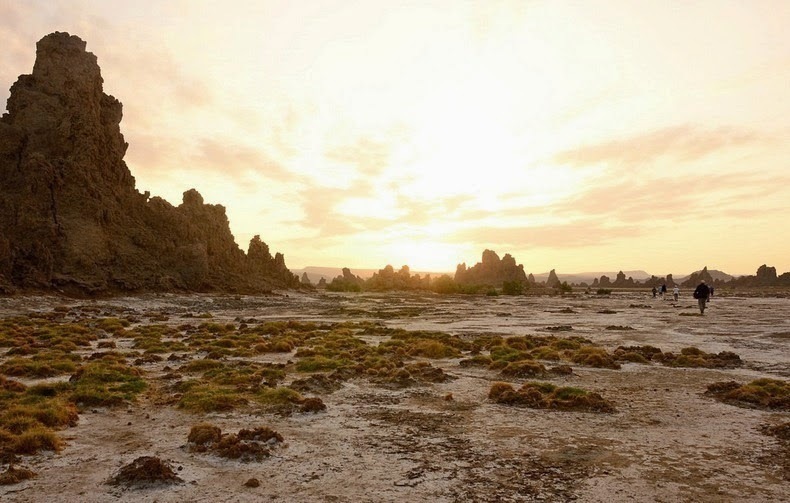 In spite of intense heat, I took the chances to make film in early morning and late at night. In fact it’s a basaltic shield volcano and there are only 6 in the world. 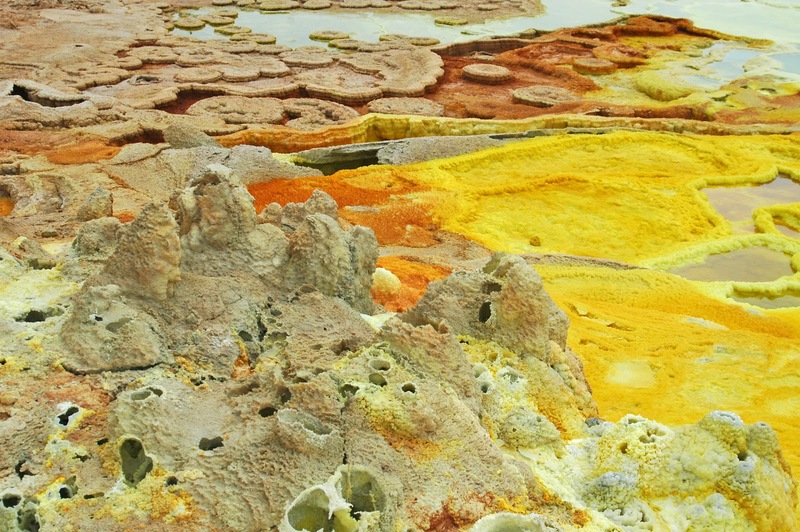 This is actually an unbelievable experience, amazes me how nature works. 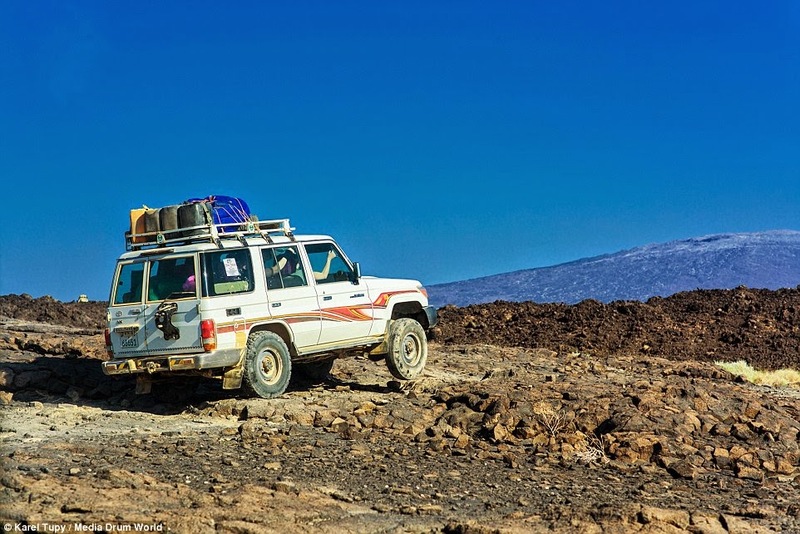 In 2012, various tourists were kidnapped, injured and some of them killed in this area. 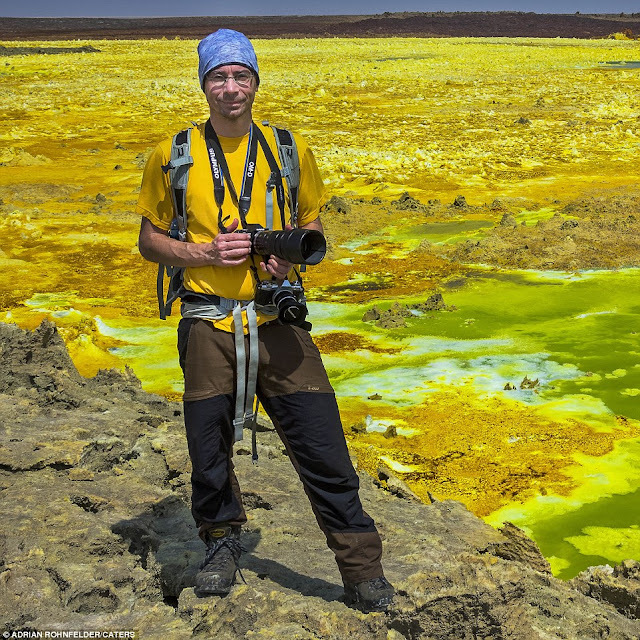 So, my passion and aim didn’t hurt with these facts. 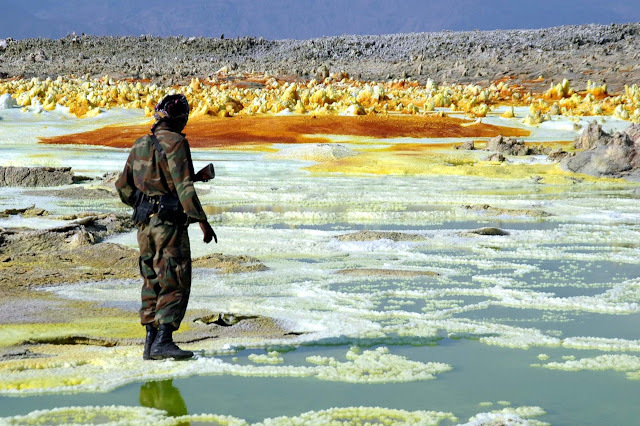 However, now Ethiopian military camp site has been established there to protect visitors. 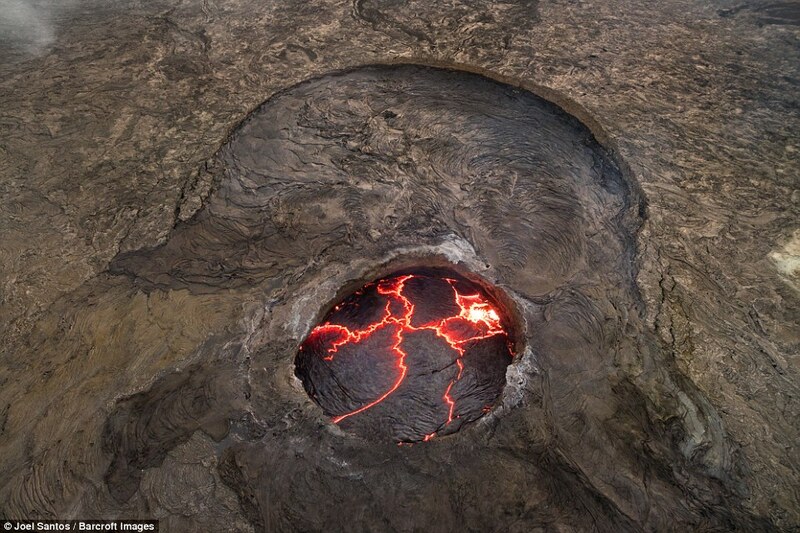 In 2009, BBC TV show The Hottest Place on Earth went there to record a world first 3D laser image of the volcanoes, provide a unique window into our planet's interior. The Gateway to Hell is the incandescent bubbling lava lake hisses like some badly burned porridge cauldron, overturning and occasionally belching molten lava. 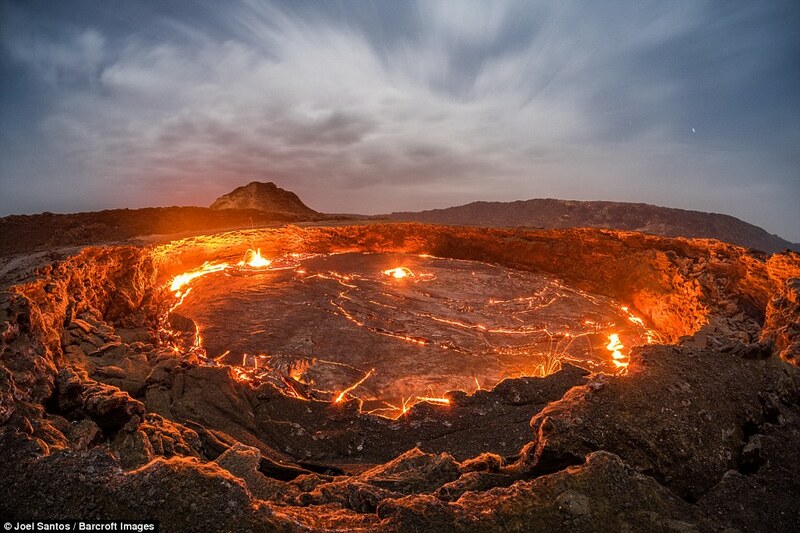 Well, is this the gateway to Hell? 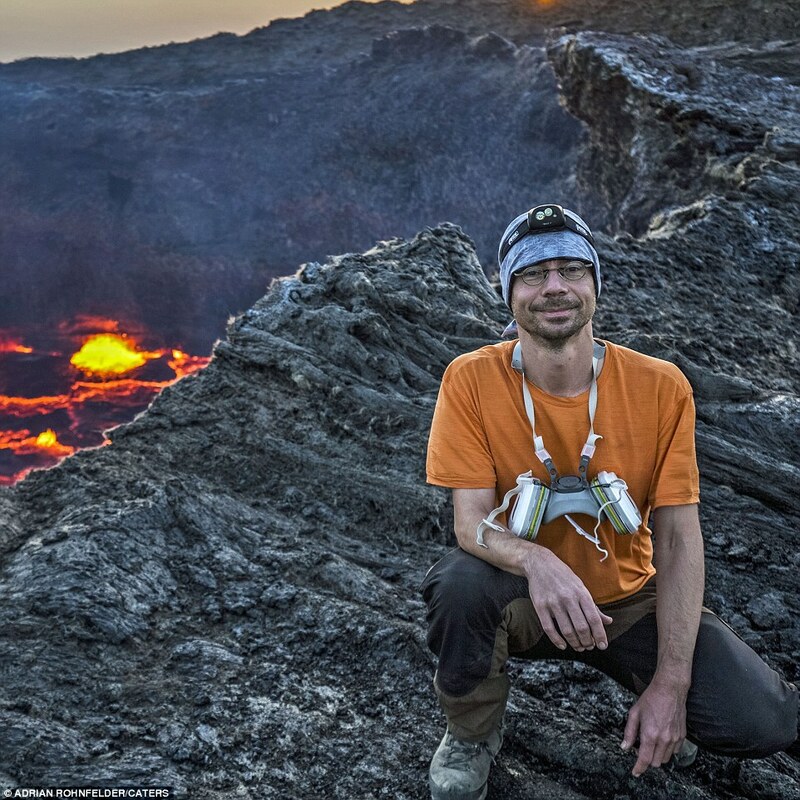 A very daredevil photographer travels to the edge of 150-feet wide active lava lake named after Satan's kingdom. If we must imagine the fiery depths of hell, the mental image can't be far from these incredible images by Karel Tupy of Ethiopia's Erta Ale, the world's oldest continuously active lava lake. The 35 years old photographer “Tupy” says; he was frightening about his camera may would have melt from the scorching heat of the lava as he captured the intimidating scenes of the 150-feet wide basalt volcano. 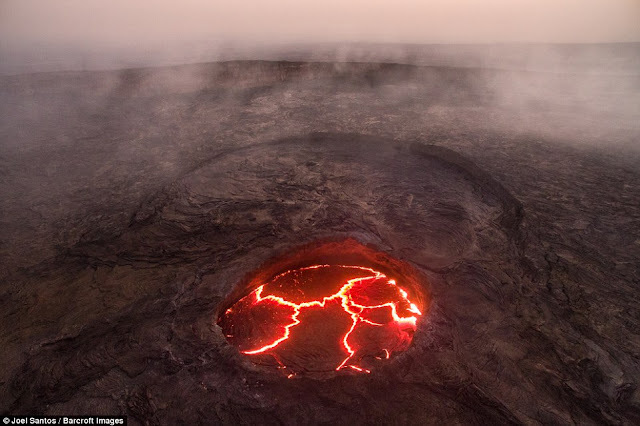 Without any doubt the view is simply staggering as lava inside the volcano is constantly moving, bubbling and bursting. 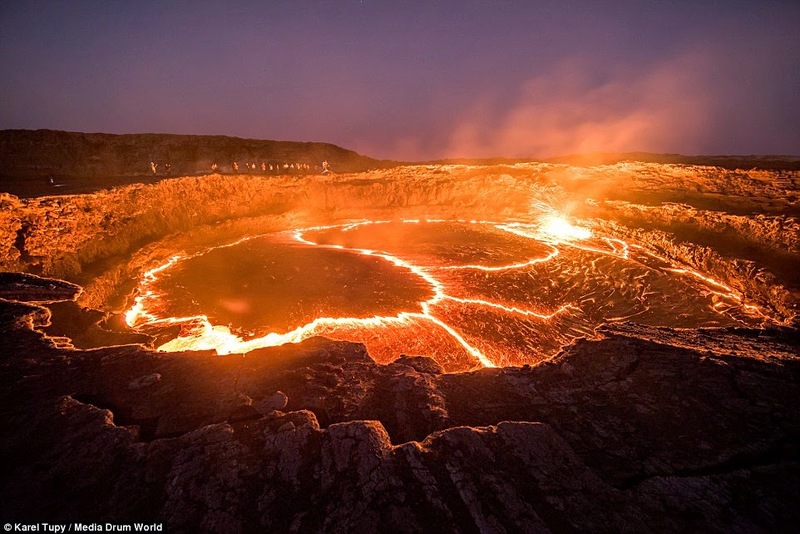 There was immense heat and when I got to an edge of the crater, it was unbearable. 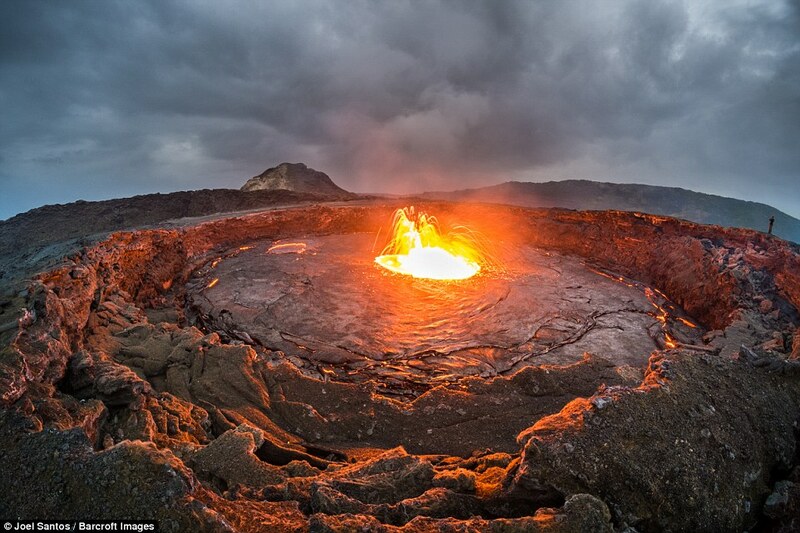 After couple of seconds, my facial skin was so hot, I had to get away. 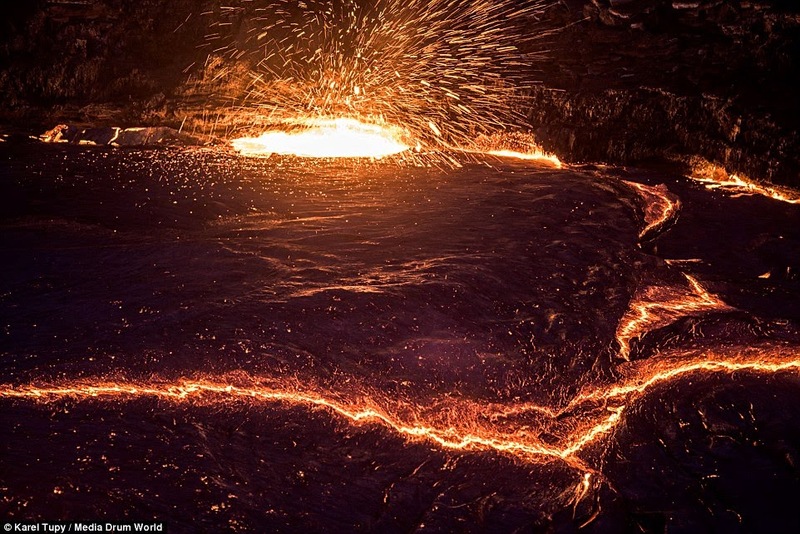 Although there was a point where I was afraid my camera was going to melt. 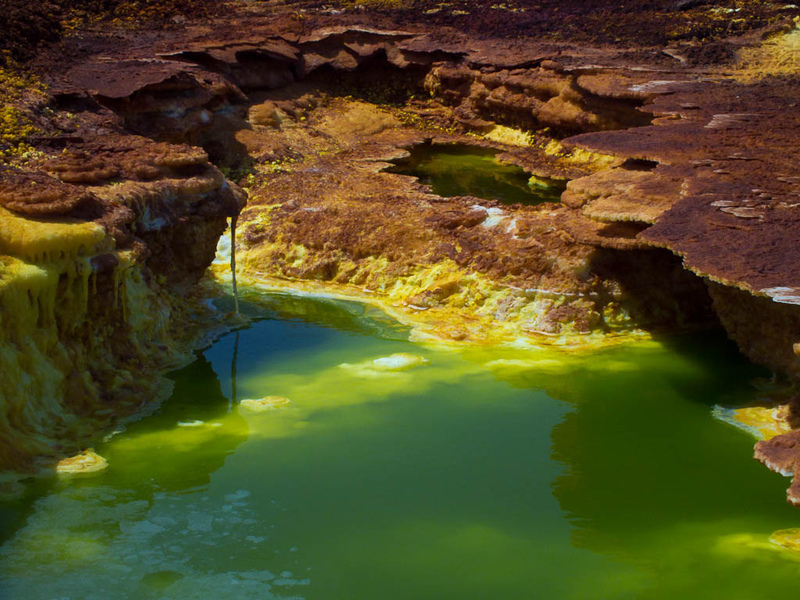 Lava Lakes can be found in the badland desert area of the Afar Depression in north-eastern Ethiopia, Erta Ale's famed lava lake formed around 1906 and is one of six in the world. The volcano's name translates in the local Afar tribe's language as “smoking mountain” though the pit to its south is recognized by locals as “The Gateway to Hell”, an appropriate moniker given the luminous lava spitting lava and searing heat. Though locals aren't particularly welcoming to outsiders and the surrounding terrain is far from hospitable, travelers do make the journey to witness this real natural phenomenon. 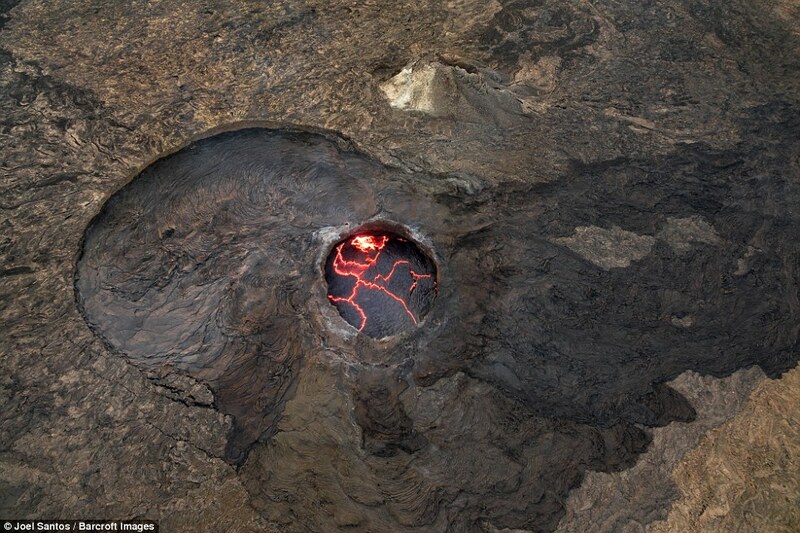 In 2009, BBC TV show The Hottest Place on Earth went there to record a world first 3D laser image of the volcano. 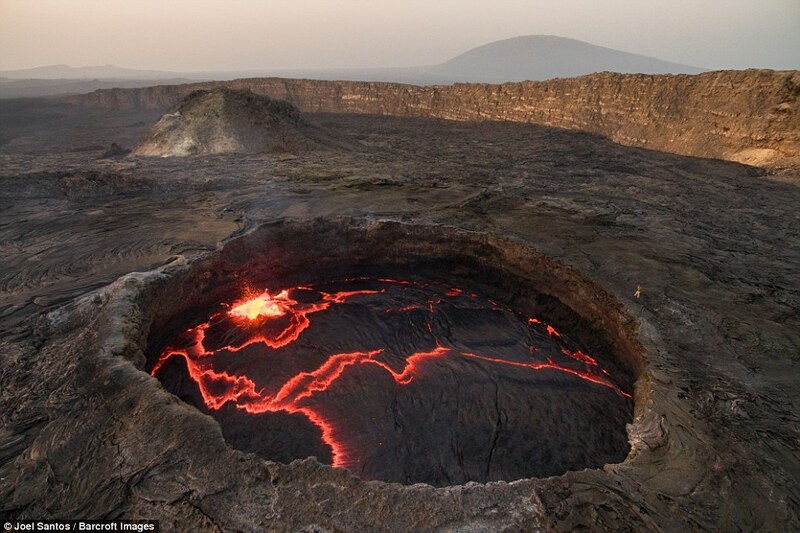 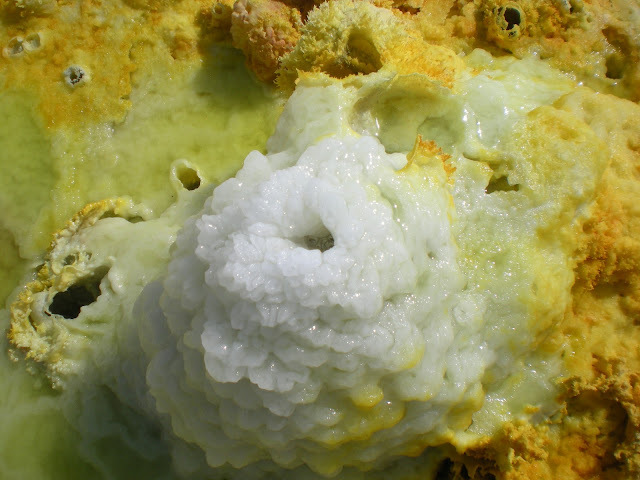 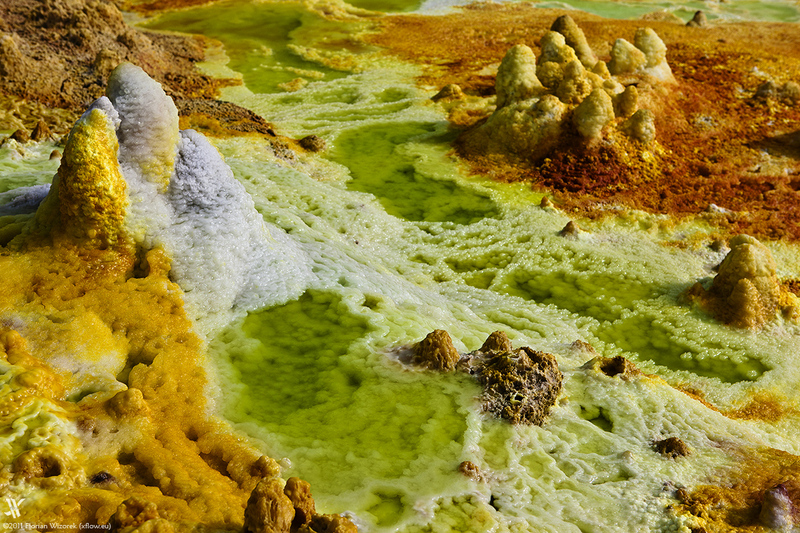 Like a true journey to the center of the Earth, volcanoes offer an exclusive window into planet’s interior. 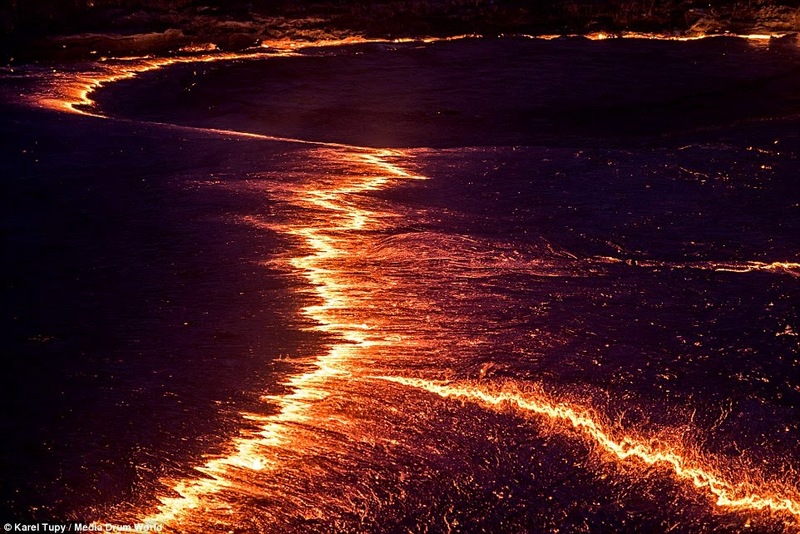 Standing at the lip of the lava lake you can see why the locals see this as "The Gateway to Hell", as the incandescent bubbling lava lake hisses like some badly burned porridge cauldron, overturning and sporadically belching molten lava. Having gained his own access to the area, in which five people in a group of scientists and tourists were killed while others were taken as hostages in a 2012 attack claimed by the Afar Revolutionary Democratic Unity Front (ARDUF), Tupy couldn't agree more with Dr Jerram's impression. However the lava is almost 25 feet below the edge, sometimes during a burst the lake spits the lava outside the crater, so you’ve to be very careful not to get hit by it. 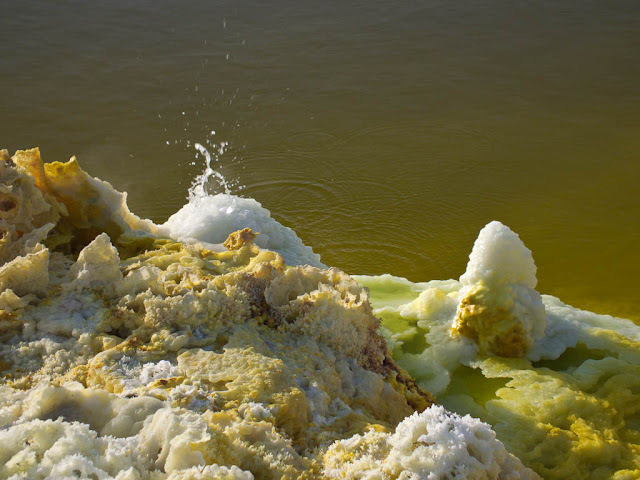 What you get hit by quite often though is fumes. Whereas is very necessary to avoid contact with lava, apparently, it's the fumes that can be the worry. Though, the environment gets far worse that what he experienced. 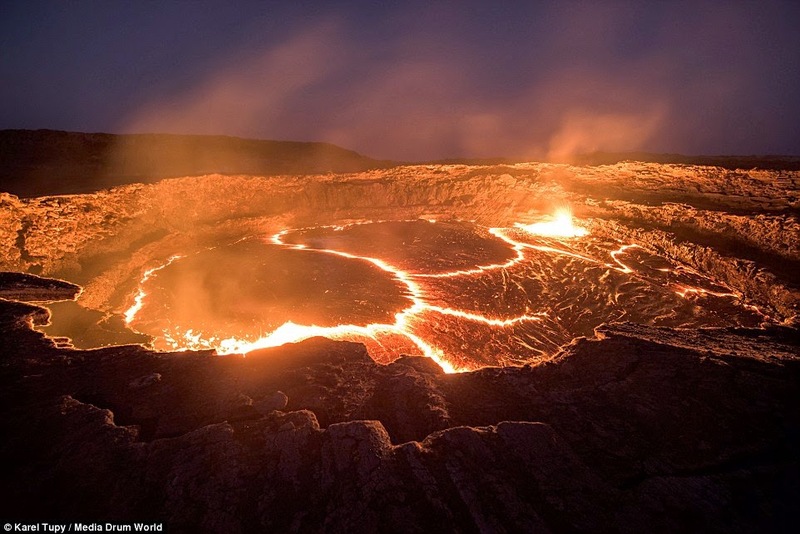 In September 2005 an eruption killed more than 250 head of livestock and forced locals in the surrounding area to flee. 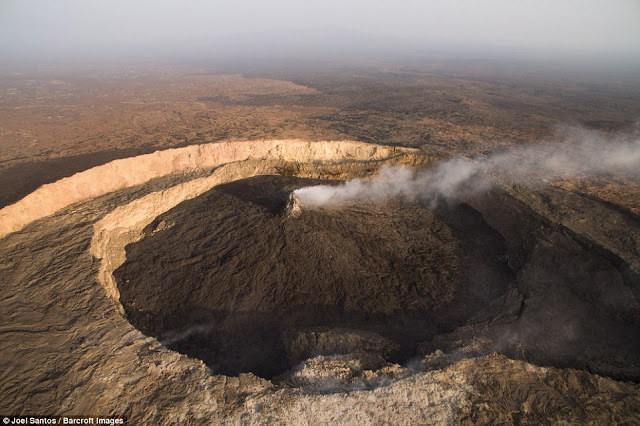 There were more evacuations in August 2007 caused by lava flow, after which two people went missing. 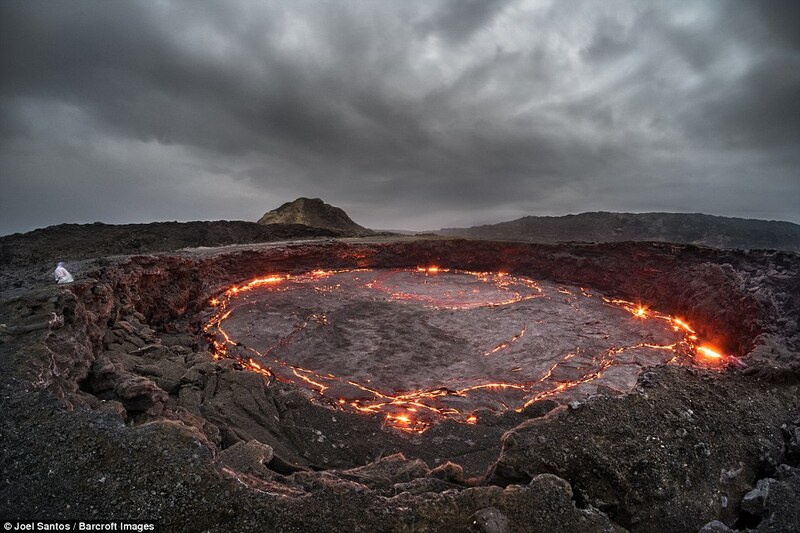 The last eruption came in November 2008. 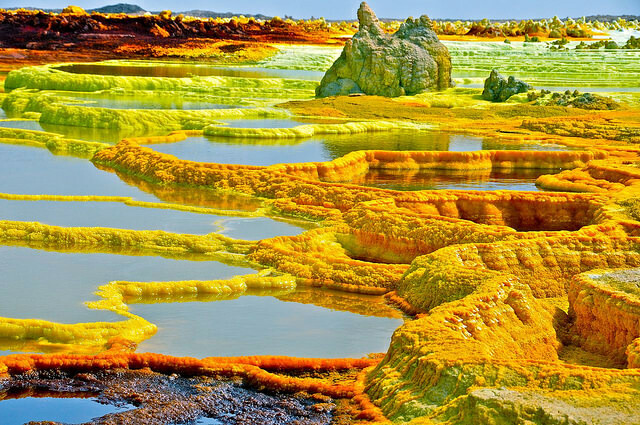 This place is something you don't see every day. As a photographer, I get to see astonishing places and when you see that people like those photos. 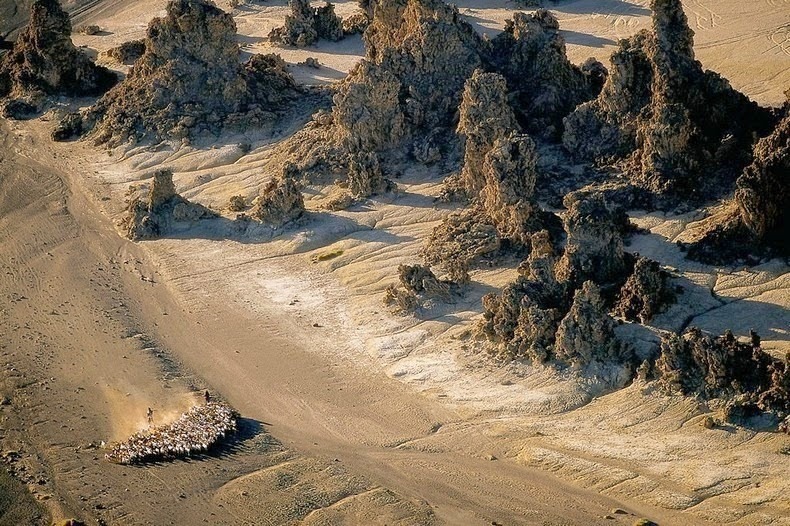 This is kind of a reward in itself. 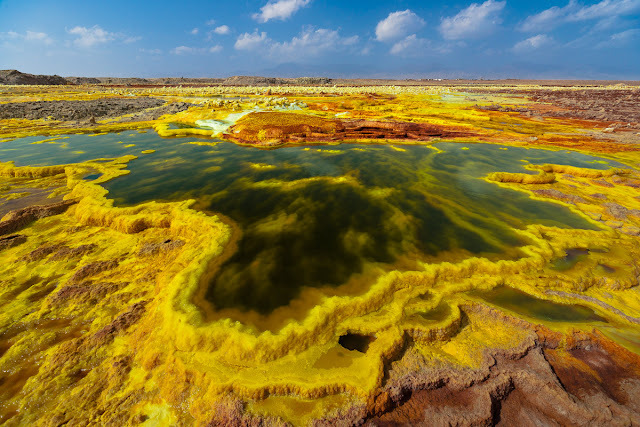 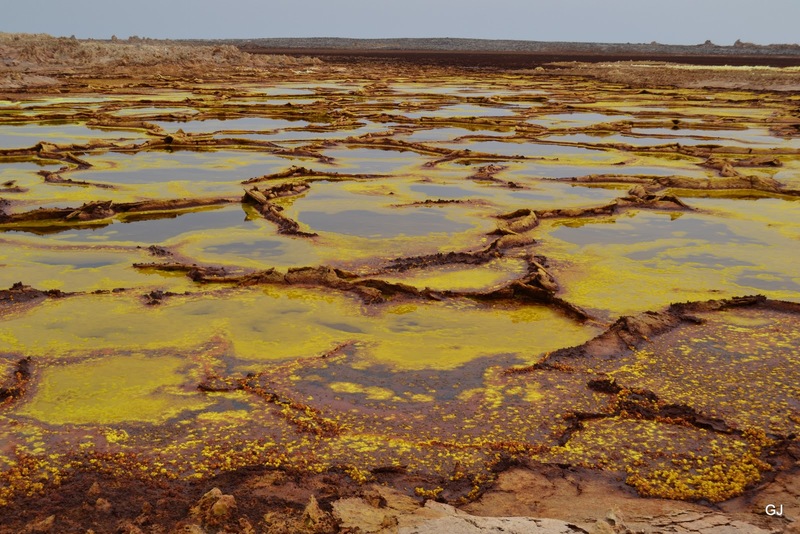 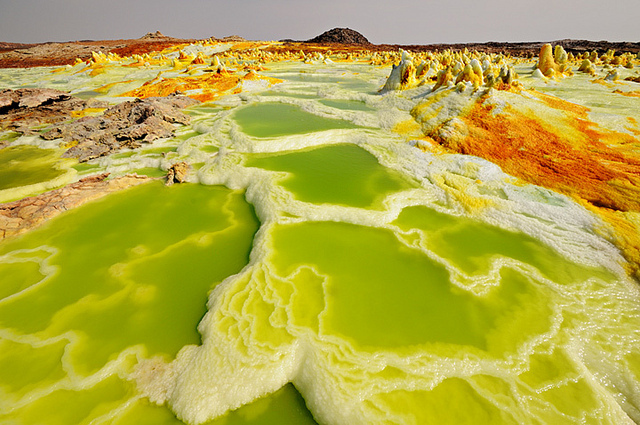 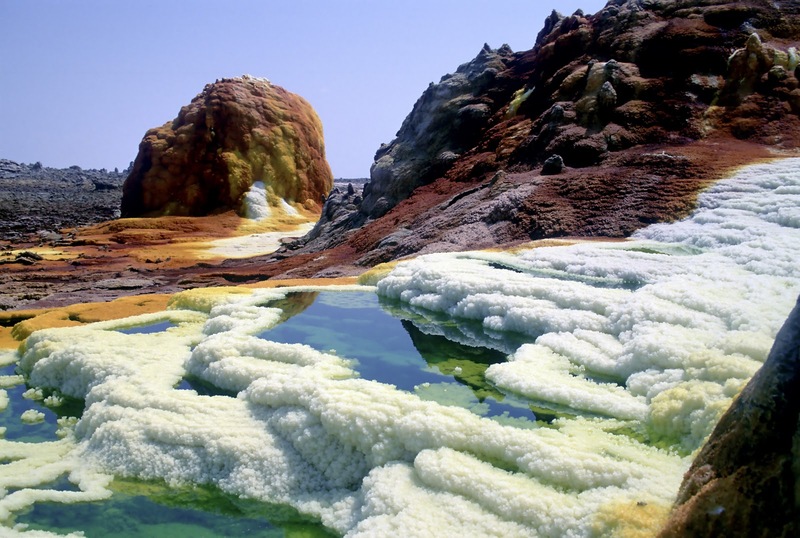 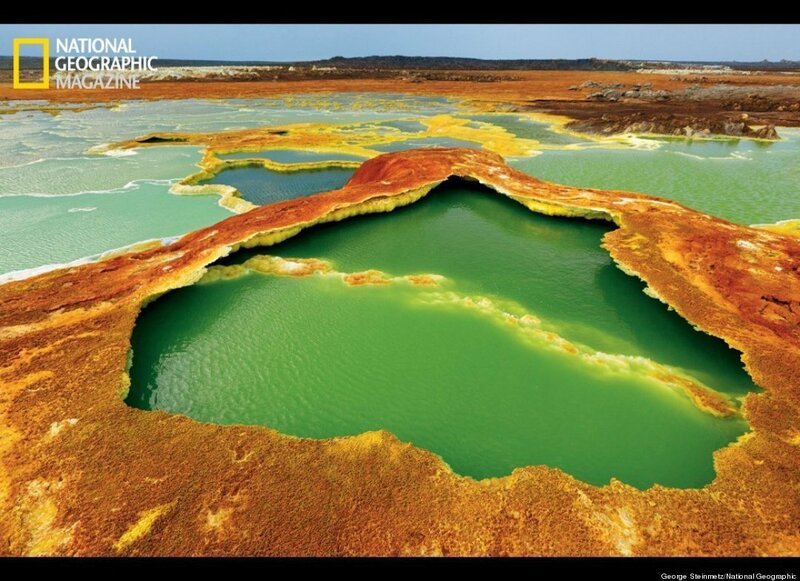 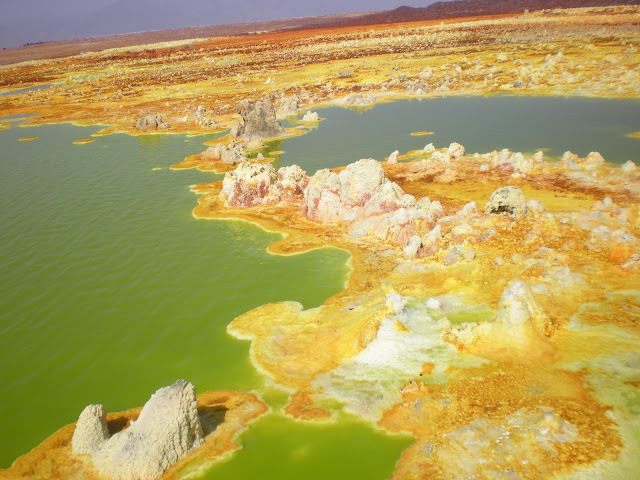 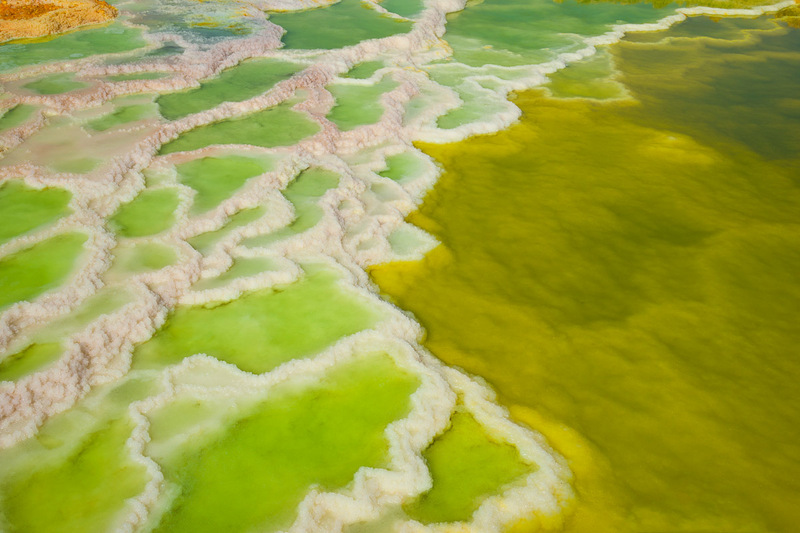 Well, The Lake Abbe is actually a salt lake, the largest and final of a chain of 6 connected lakes on the Ethiopia-Djibouti border. 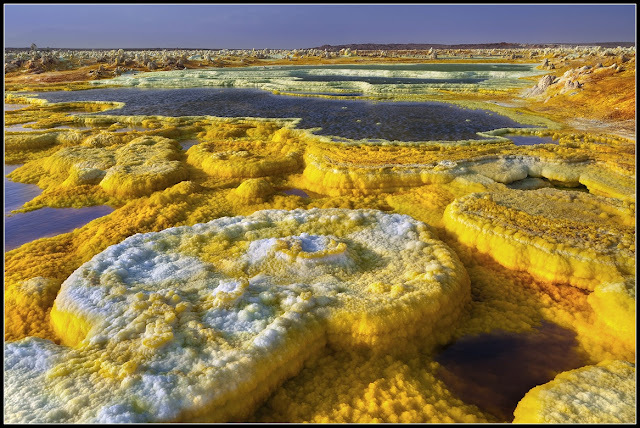 The lake Abbe lies on a basin which is called the Afar Depression at a point where the Arabian, Nubian, and Somalian plates are pulling away from each other. 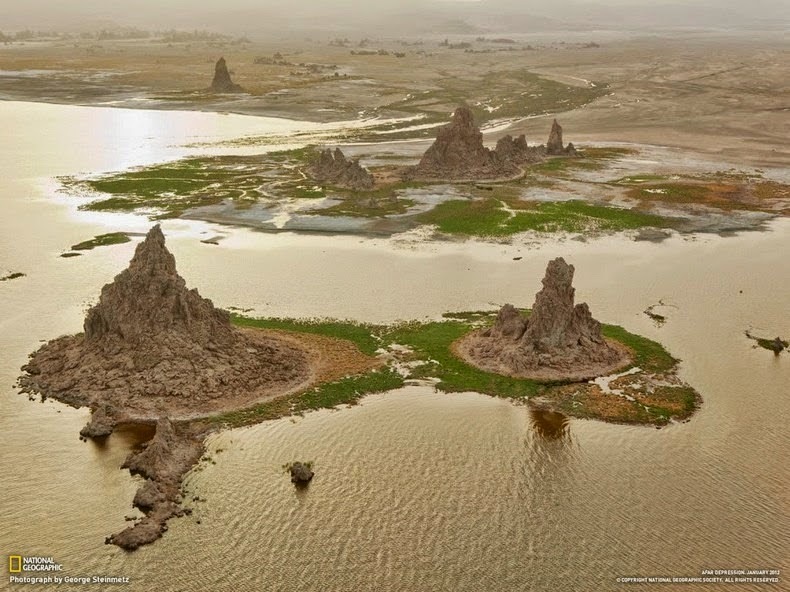 The strain set off by the splitting Nubian and Somalian plates has formed a peculiar landscape around Lake Abbe. When the two plates drift apart, the crust above them thins until it cracks. 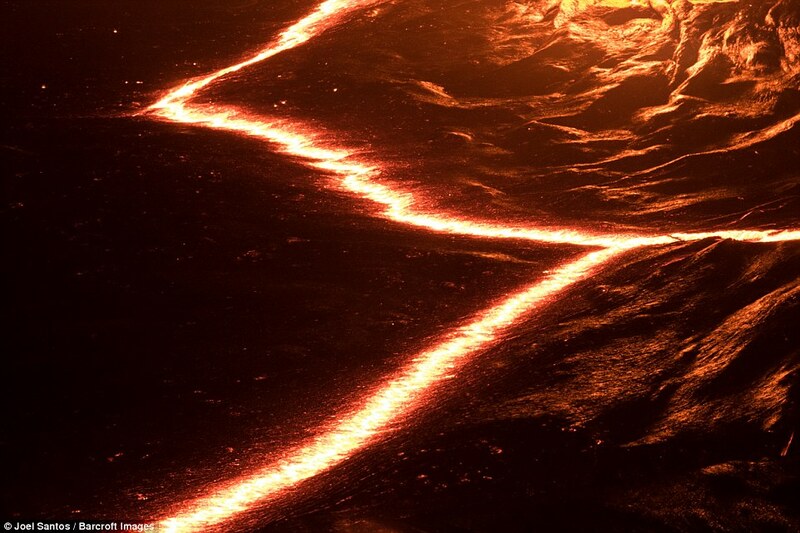 Moreover Magma pushes to the surface via the thin spots and warm underwater springs. 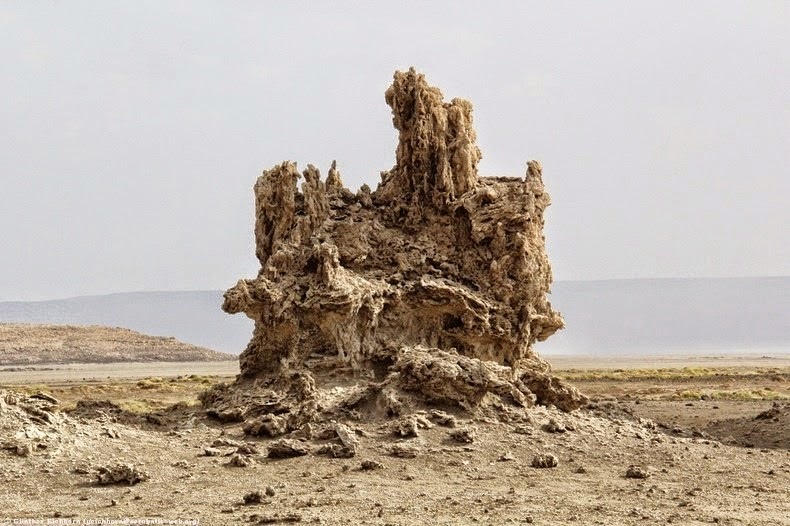 When the boiling water bubble up to the surface, they put the dissolved calcium carbonates generating towering chimneys, the same way water trickling down the roof of limestone caves makes stalactites and stalagmites. 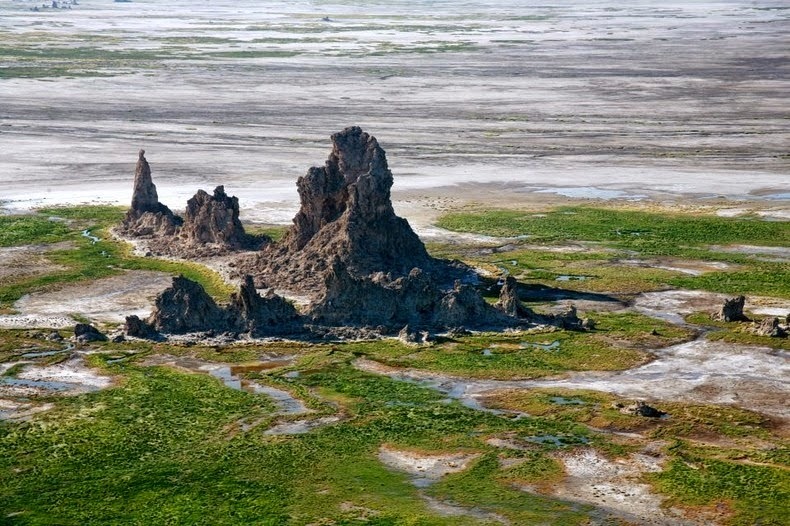 Specific of these chimneys can reach about the heights of 50 meters, and puffs of steam vent from the top. 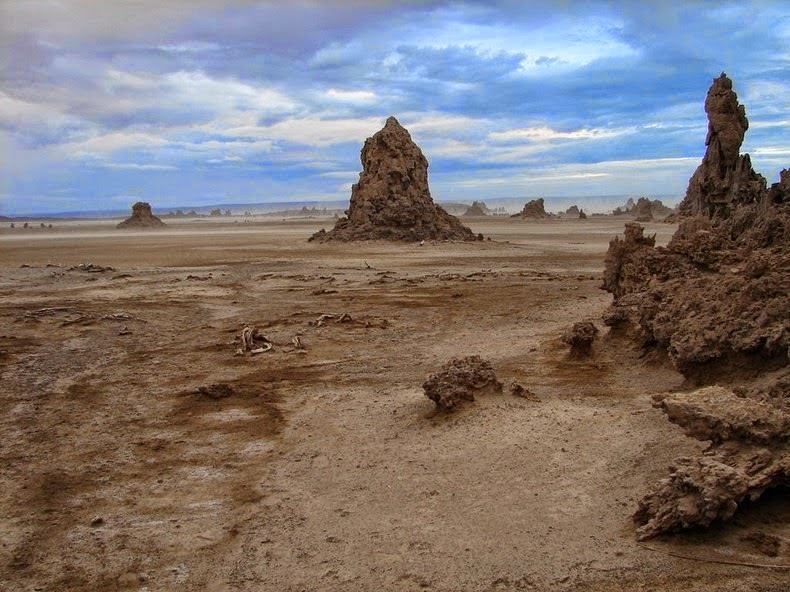 Moreover the strange landscape motivated Charlton Heston to shoot his classic 1968 film, "Planet of the Apes", on the shores of Lake Abbe. 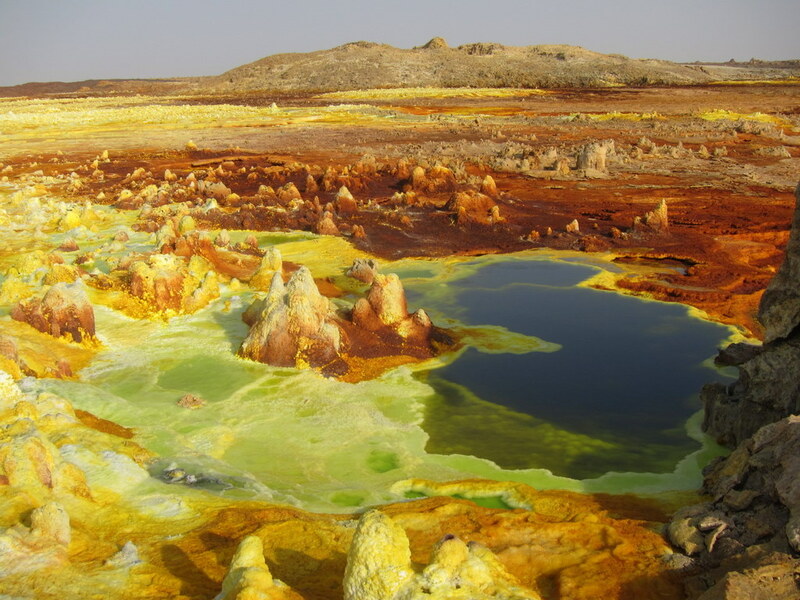 The Afar Depression is captivating to geologists since it is the place where new ocean is being shaped. 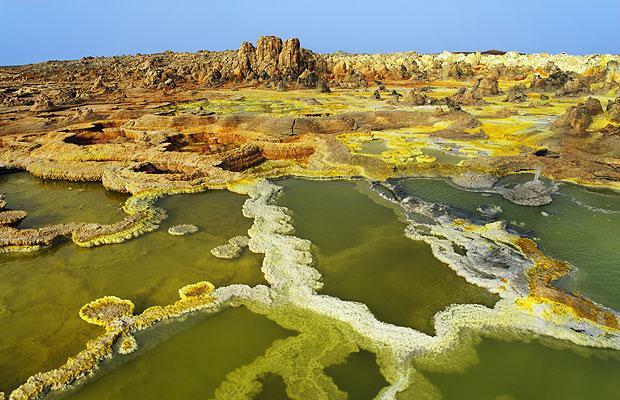 Therefore the depression is forming as the African plate ruptures into the Nubian and Somalian plates. 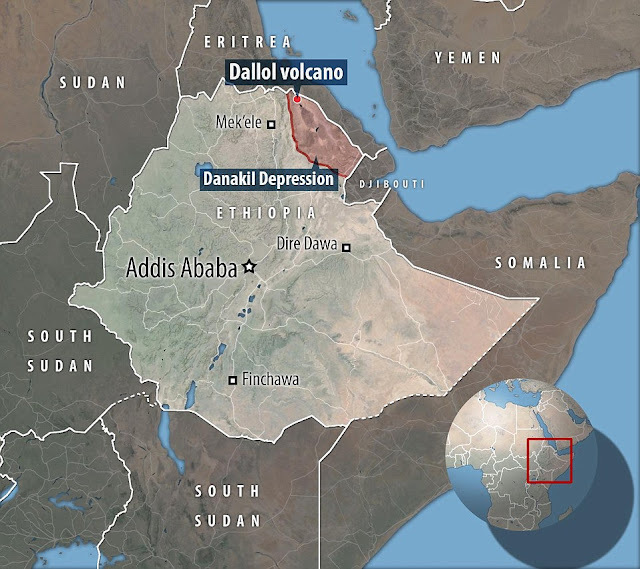 In a few million years, the Indian Ocean will break down through the coastal highlands and flood the Afar Depression, forming a new ocean and making the Horn of Africa a large island. 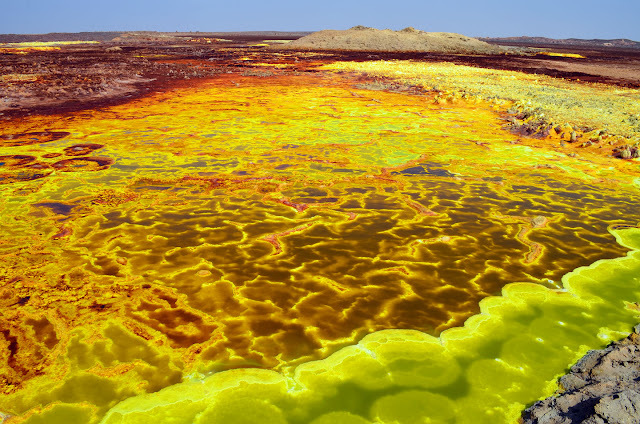 Hence when continental plates move apart in the ocean, it generates new sea floor, but in East Africa, the procedure is happening on dry ground, where it is called continental rifting. The Lake Abbe is mainly fed by the Awash River, and seasonal streams which pass in the lake from the west and south, crossing the vast salt flats. 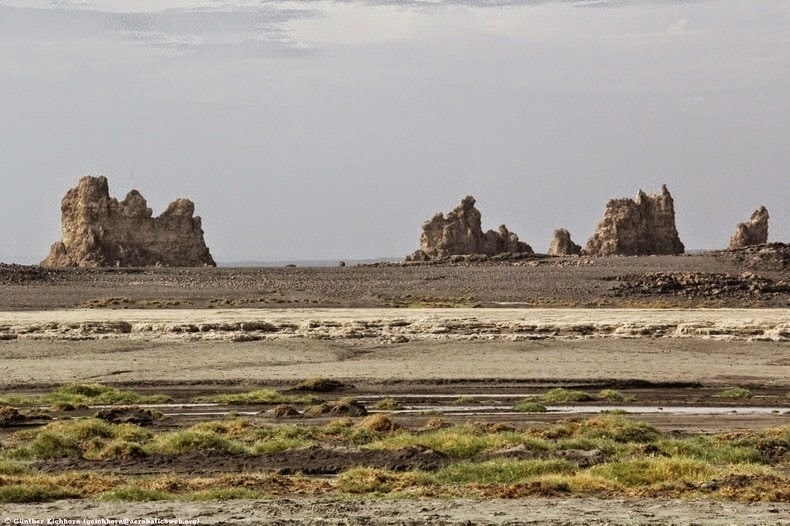 On the northwest shore rises Mount Dama Ali, a dormant volcano. 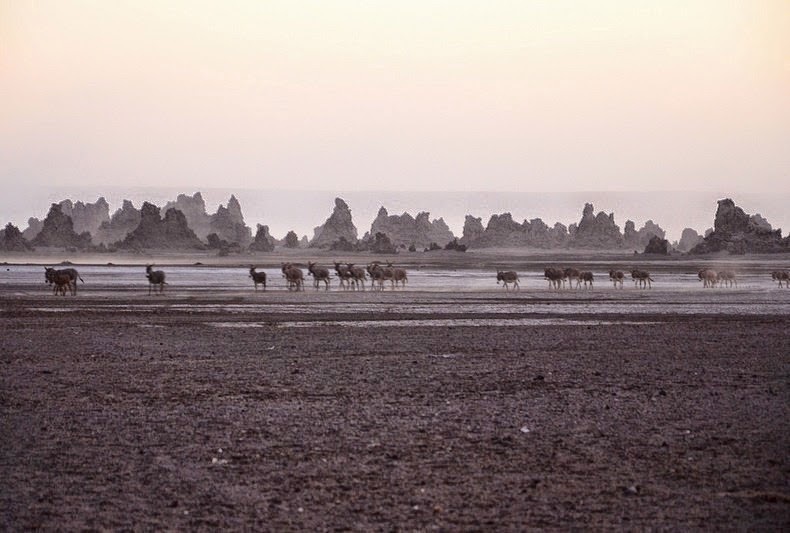 The history tells us, that the Lake Abbe was once a much larger lake but diversion of water from Awash River for irrigation in the 1950s has dry up the lake surface area by 2/3’s and water level by five meters. 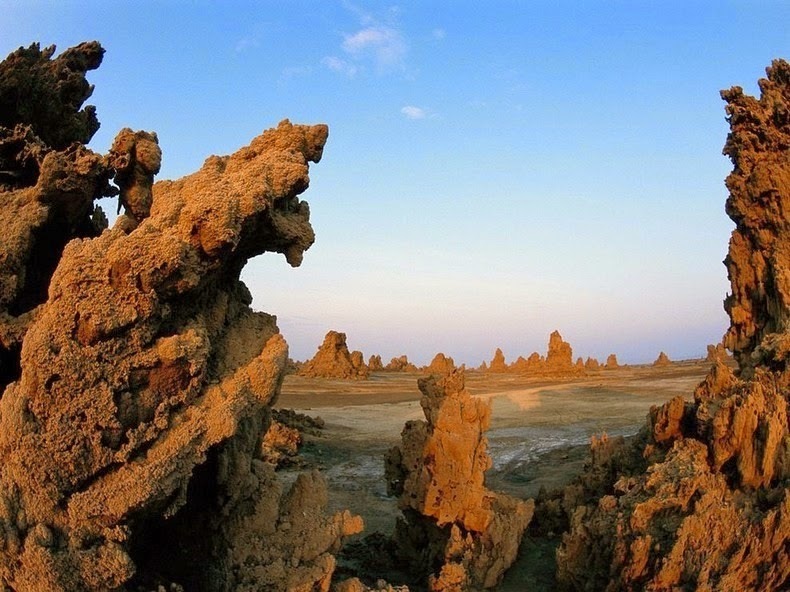 The adjacent town lies about two hundreds kilometers away, but there’s a little settlement established by the Afar people near the lake's shore. 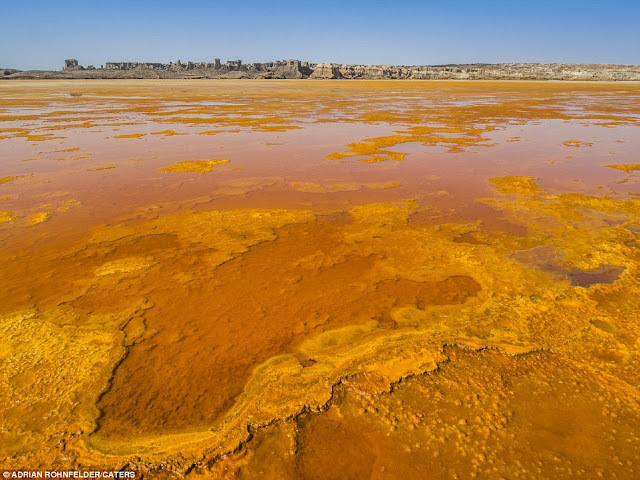 Aside from the Afar shepherds who bring their herds of sheep or donkeys to feed, the only inhabitants of this lake are pink Flamingos.